All good things must come to an end and today is that day for the Foundation Fabric Blog Tour. The fabric will be out in stores in March/April, so be sure to look for it and share any projects you make! Now, let's recap all the amazingness that happened these last two weeks. Some talented makers really put their all into some amazing projects. I am blown away by all the quilts, bags, pouches, chill pills, placemats, wallets and shelves, all made with Foundation. It was two weeks stuffed full of inspiration! If you weren't able to keep up with all of them, no worries! We are going to quickly recap with links here, so you can go see them all again! It has been a dream come true to see what people will make with my fabric and I hope to keep seeing projects in the near future! All the project photos were taken and belong to the makers. Giuseppe, of Giucy Giuce, kicked off the blog tour with this fun twist on a dresden. The pillow is made with the greys and black prints in curved background pieces and epp hexagons that create a spectrum around the pillow! Check out his IG post to learn more! Tara, of Wefty Needle, created these amazing Hexiecomb shelves for her stop along the blog tour! 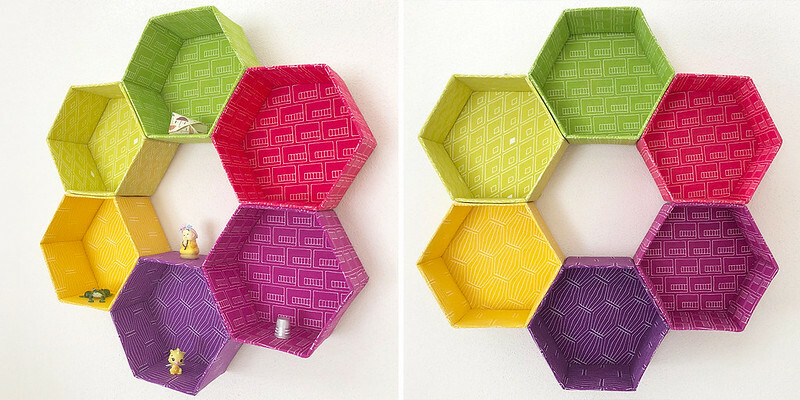 These hand-sewn shelves are made with 6 different bright prints, cardboard, fabric glue and thread! Want to make some of your own? Grab the pattern and read about it here. 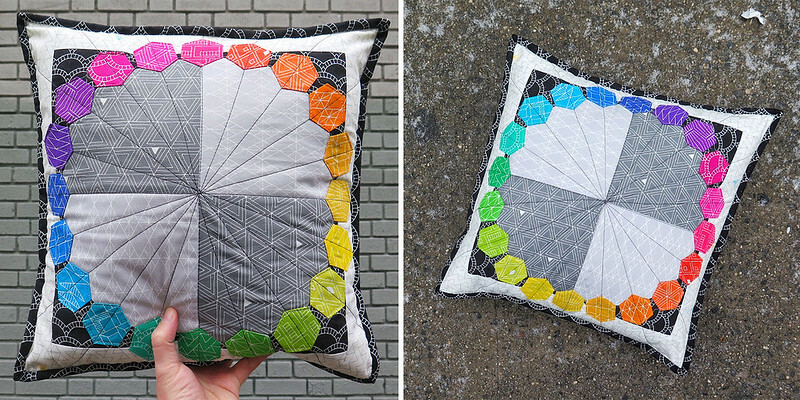 Nichole, of Wild Boho, made this beautiful embroidered rainbow pillow using her Fractured Rainbow pattern. This project is so eye-catching and those stitches are to die for! She will be teaching the pattern next week at QuiltCon. See more photos on her blog! Robin, of Robin Ruth, went above and beyond with these stunning placemats made with her strip-pieced Mariner's Compass technique! She made 9 different versions of these placemats and I don't know about you, but I want them for my table! Check out her blog for more inspiration! 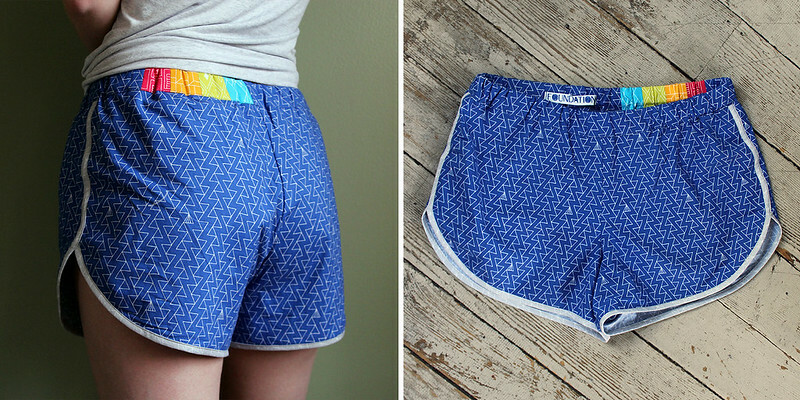 Jessie, of Jessie Stern Sews, made these adorable pajama shorts for her stop along the blog tour! She used the Wisteria Triangle print for the shorts, the Silver Diamond print for the bias binding and added a little rainbow along the waistband. Read her post to hear all about her process! Jessica, of Sew Many Creations, made a few different projects for her stop along the blog tour! 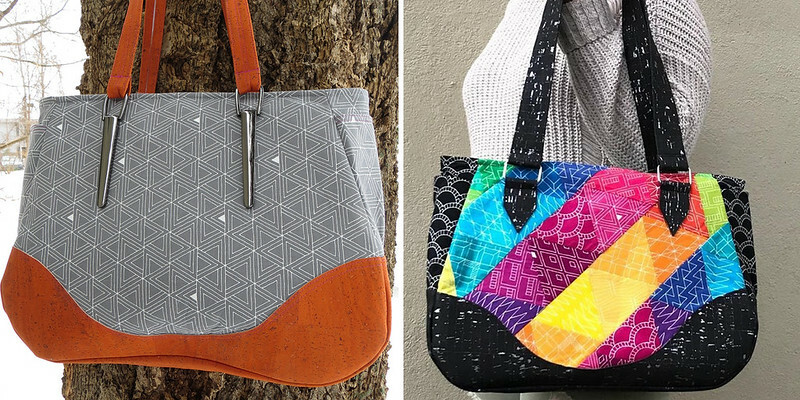 She made two of her Harper Handbags, one with rainbow piecing and black cork and one with the Graphite Triangle print and orange cork. Check out her blog post to also see the amazing quilt she made! My Mom, Kristy of Wolf Creek Quilting (and Sass! ), enlarged one of our popular Arcadia Avenue blocks and made a quilt with it! I love how big the block is and how the prints look in the bigger spaces. See close-ups of her amazing longarm quilting. Sarah, of No Hats in the House, began to make an enlarged Folksy Fish for her project! She ran out of background fabric and whipped up these great wheatgrass and essential oil filled Chill Pills with Foundation. I hope the fish will one day swim =] Check out her IG post to learn more! 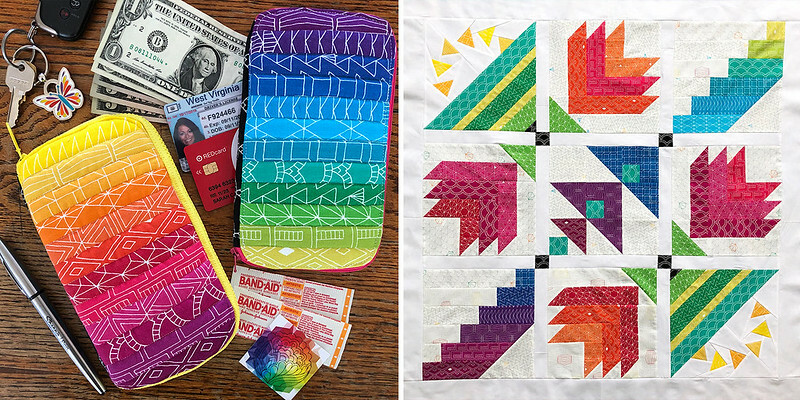 Nicole, of Modern Handcraft, created a rainbow version of her new Peak quilt pattern for her stop along the blog tour! She created a spectrum diagonally across the quilt and paired a solid white with the bright prints. 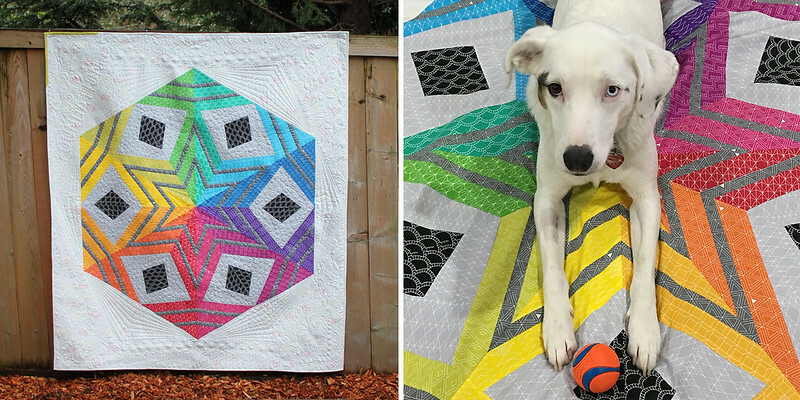 I love this gorgeous quilt and as always, Nicole's patterns and photos are just perfect. Check out her blog post to get a pattern and see more photos! Elise, of Elise and Emelie, made this stunning tote bag for her Foundation project! 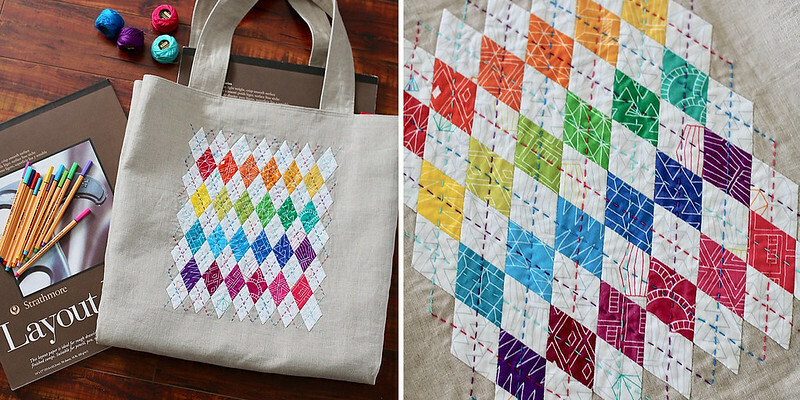 She used all the colorful prints and low volumes to create an argyle look on the tote bag with some english paper piecing and hand stitching with embroidery floss. See more photos on her blog! 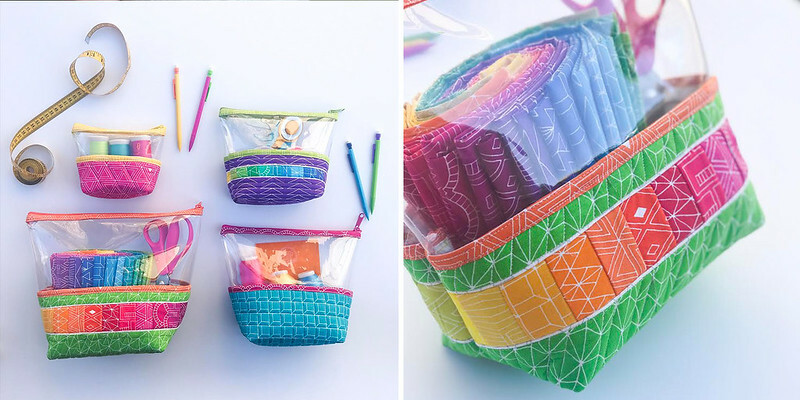 Kaitlyn, of Knot and Thread Design, made up some of her adorable Hello Pouches for her stop along the Foundation Blog Tour. I love these little pouches and want to make a bunch. Check out the amazing piping detail on there! Head over to her blog to read all about it and get the pattern! Sarah, of Sariditty, made a few projects for her day! First, she whipped up two of these rainbow Sew Sweetness wallets that are the perfect size for cash, credit card, keys and phone! Next, she used her QuiltPro software to make a beautiful quilt top. Check out her IG to see more! 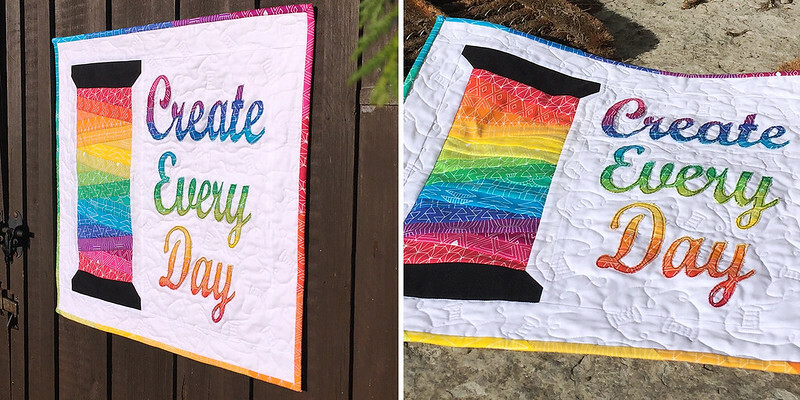 To wrap up the blog tour, Jo, of The Crafty Nomad, made this colorful mini quilt featuring a rainbow spool of thread and the phrase "Create Every Day." This is perfect little reminder mini quilt to add to your sewing room! Grab the pattern and see more photos on her blog! We are doing a little giveaway! We are giving away 5 total prizes and you could be a winner. 4 Prizes - 1 charm pack (5" squares) of Foundation + 2 Sass patterns of your choosing. 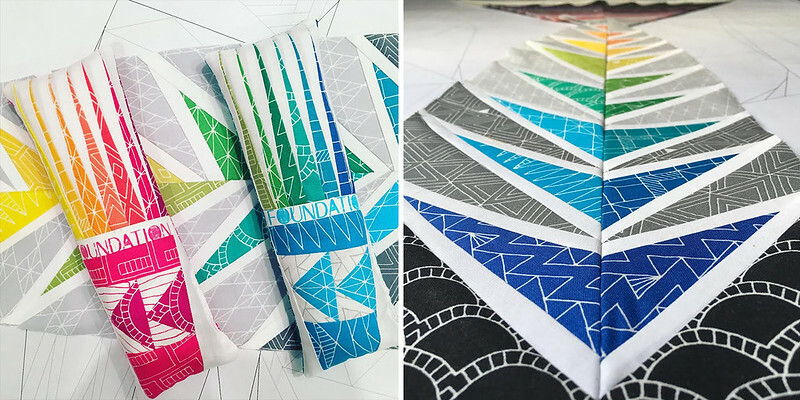 Grand Prize - 1 fat-quarter bundle of Foundation + 5 Sass patterns of your choosing. To win, comment here about what you would make with the fabric and give some kudos to one or more of the makers from the blog tour! Giveaway closes Friday, February 23rd, at Midnight, PST. Thanks again to everyone who participated and followed along! I can't wait for this fabric to be out in the wild this March & April! I can’t wait for this fabric to come out, I love it so much! I’ve enjoyed the tour and have some new blogs to follow too! I would make a bag, and I’ve been wanting to make a Gravity Quilt, and this fabric would be perfect. Wow! Everyone did such an awesome job that it’s hard to choose. I love them all. The create everyday banner would be first on my list to make. Those Hello Pouches are calling my name for sure…the rainbow colors and that pattern would be so perfect for Christmas gifts! Thanks for the giveaway! I have been waiting impatiently for this line to get where I can buy it for my son’s HST rainbow quilt, which I am desperate to make/finish for him before his 5th birthday! I never got around to making him a baby quilt, but this queen-sized quilt will hopefully make up for it! 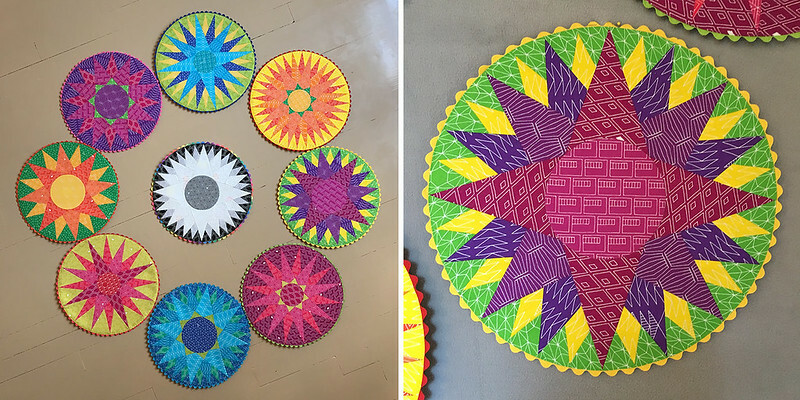 I love all the projects on the blog tour, but those placemats! They are just over-the-top incredible! This is such a gorgeous line that i’ll Be breaking my rule about not buying more fabric without a plan to just buy a ridiculous amount of each one! Everyone will call me “that girl obsessed with Foundation fabric”! Congrats on such a fun first collection, Shayla. Robin Ruth really knocked herself out. 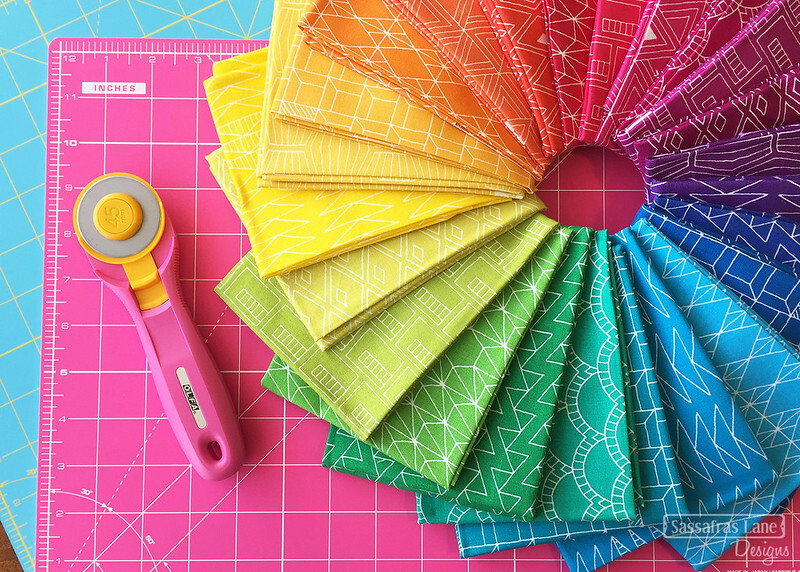 Love her rulers, and the designs she came up with using your awesome fabric are amazing! I am so blown away by the creativity – wow those wall shelves are awesome Tara!!! And I am in love with Nicole’s Peak Quilt – so pretty Actually everyone did a fantastic job and the fabrics are wonderful!!!! What fantastic rainbow—ness! Maybe it’s winter in Maine getting to me, but I’d love to make a cute pair of shorts like Jessie did—or, more practical for the weather, Nicole’s gorgeous (as usual) Peak quilt. I would love to make some organizing pouches like Knot and Thread’s. I would make a fun rainbow quilt for my friend’s rainbow baby! ❤️? I would love to make a rainbow quilt! And I love the hexie shelves from Wefty Needle! I would use it for a quilt! I love the argyle bag and the create every day banner- so beautiful! I have a design in my head for a sweet little mini quilt (rainbow) ? and I really love the Knot and Thread Hello Pouches! I love these fabrics. They are so bright and cheerful. I don’t have fabric for a project right now. I would like to make the wallets by Sarah. All the pockets in the design are great! I love the Hello Pouches by Kaitlyn because you can see thru them! I think my granddaughter would love the shorts by Jessie! I’d love to make those too! Great looking fabric! I already have plans to buy some of one of the low volumes to go with some fabric I have picked for a quilt, which just so happens to be using one of your patterns. ? And I’m thinking I’ll need some of the colors to make myself some hello pouches. I already have that pattern and love how hers came out! ?? Oh, I LOVE, LOVE, LOVE Crafty Nomad’s “Create Every Day” mini! It’s beautiful and inspirational! So pretty! I think I’d make some sort of quilt, too, or a fun tote bag with a matching lanyard or other cute accessory. I’m loving these rainbow colors. Gorgeous! Omg! This fabric is to die for! I would definitely use it to make a rainbow mini! Love everything that’s been made! I just made my first rainbow quilt and I think I’m up for another and this fabric would be perfect! I love all of these! 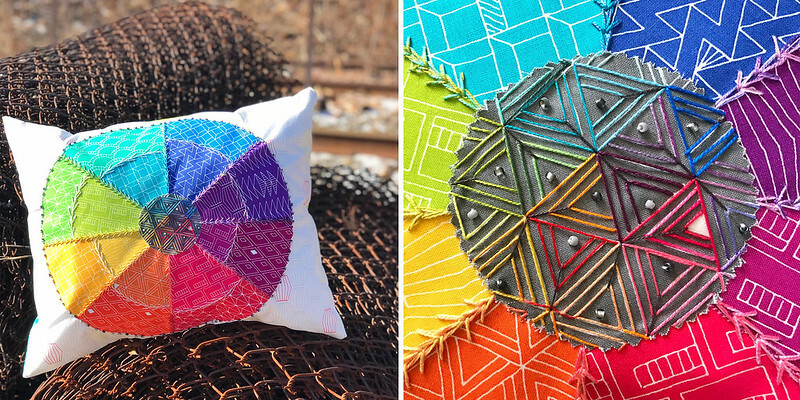 Modern Handcrafts quilt is super awesome! I would definitely make a quilt or wall hanging with these! Wefty Needles shelves are amazing – would be perfect for rainbow-ising my new sewing space! I’ve just started a charity quilt for a local marine rescue organisation to auction – I would love to include some Foundation in it! I am mesmerized by this fabric as well as every project created with it! My favorite is Elise and Emelie’s argyle bag though. What a great idea! The problem would be choosing one specific project, they would go with just about everything already in the stash! Especially since the prints, need some basics!! All the samples are great! Really liked the tote bag and pouches! I need some primary fabrics for a map quilt, a sewing themed quilt, and it would be great to make one of your patterns in my stash with your fabrics! Loved the blog hop and I can’t wait until the fabric is in the stores. So many great ideas, but I think the mini wall hanging and the bags with the clear vinyl on the top are a couple of my favorites. Not sure what my first project with these fabrics will be, will have to see what feels right when I have the fabric in hand. Super collection and lots of great projects! I think my favorite might be the Peaks quilt. Would love the chance to make a ? project or two! I would make rainbow colored bags for days and days! Loved the mini featuring a spool of thread and saying “Create Every Day” by the Crafty Nomad. What an awesome idea. Would love a mini like the Crafty Nomad. I would also like to make a nice bright rainbow table runner ? This has been such a beautiful and inspiring blog tour to follow! I’ve had rainbow hexies on my mind since seeing Giuseppe’s, of Guicy Guice, post. And my sewing room pretty much “requires” me to make Jo’s, of The Crafty Nomad, Spool of Thread Mini, Congratulations on your Foundation Fabric collection with Windham Fabric! I am in love with this collection. I would use it in the Cadence Court patten and would love to do a bag like Jessica’s. I can’t wait! ???? I am so super excited for my fabric to arrive! I really want to make the Mod Tv pattern with it. It would be the supreme combo! So gorgeous, can’t wait to get my hands on it! I love Wefty Needle’s honeycomb shelves. I love how she has really thought outside the box. They look amazing. I’m so excited for the release of foundation and I would definitely make a quilt. So many glorious projects! I love the enlarged Arcadia Avenue block & Guice Guice’s hexi pillow. Would love to give these a whirl with your fabrics. I loved so many of the makes from this blog tour . I bought the Paradox Point quilt pattern while at Quiltcon….. except I’m going to turn it into his and hers throws for the couch. Waiting for this fabric to do that! I would definitely make a rainbow Clarice skull moth from Lillyella! I can’t seem to find just the right fabric in stores to match what exactly how I want it, but then I saw this line and swoon I hope it’s available online when it’s released! I would love to make a mini quilt! I love Wolf Creek Quilting’s Arcadia Avenue Quilt! I would definitely want to make that and some matching pillows! I’m dying for your empire place for years…. 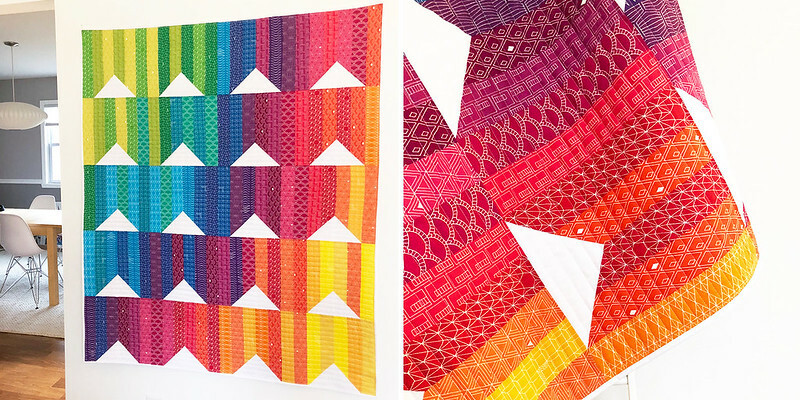 I think your gorgeous fabrics would be perfect for this stunning quilt ! I would make a throw blanket quilt for myself. Still haven’t made a quilt yet that I didn’t give away! I would make Katelyn’s cute Hello Pouches. So cute. Colors are so vivid! I’d make the mini quilt Create Every Day to remind myself that each day brings new and exciting projects and I just need to let my imagination fly. The placements are the greatest! I will be making these! Sariditty’s wallets are so pretty and I went to make some just like them!